Mike has been asking me to post this story for about three weeks. Sorry it has taken so long. I was at a working interview at a child care center and a little girl I had never met before came over to me. I was sitting down on a piece of concrete and she saw my necklace. 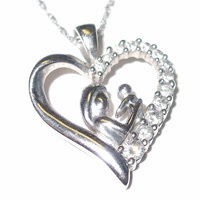 The necklace is a heart with a mother and child. She said to me, "I really like your necklace." I immediately replied, "Thank you very much." She then said to me, "It's a mommy and a baby, and it looks like an angel." I smiled when she said that and told her, "Yes it does." The necklace that was given to me when Aidan was born.